Today I found out the United States doesn’t have an official language. He wasn’t the first to express this sentiment. All the way back in 1780 it was proposed to the Continental Congress by future President John Adams that English should be made the official language of the budding nation. This was not a popular notion largely because Americans at the time spoke a variety of languages. So the idea of picking one of the more popular ones and making it the official language was seen as “undemocratic and a threat to individual liberty”. While English has come to dominate in the United States, 232 years later it still has not been made the official language for more or less the same reason it wasn’t in 1780. 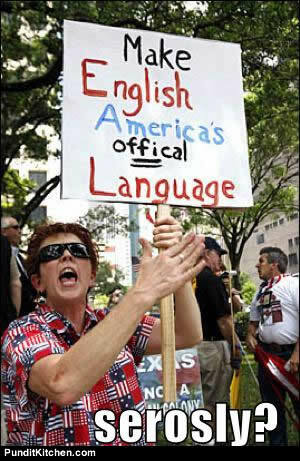 In fact, the American Civil Liberties Union argues that declaring English as the official language of the United States would violate the First Amendment. Regardless, the base “unifying force” line of reasoning is generally shot down by linguists and historians such as relatively recently by the Linguistic Society of America which passed a resolution in the late 1980s against “English Only” measures due to being “based on misconceptions about the role of a common language in establishing political unity…” And, indeed, if language was so unifying, the many prominent native English speakers who helped spur the American Revolution and the many linguistically diverse colonists who banded together in that revolution despite the differences in their native tongues would seemingly have not done so if that were the case. Here, it was the common base ideology that was important, which is really what unifies a nation or causes strife when these core principles don’t line up within a populace. Of course, people back then tended to commonly speak multiple languages, a practice which is unfortunately no longer common in the United States. So it’s not completely surprising that they didn’t view native language as all that important and that today the “threat” of another language becoming common other than English has been a slightly more prominent issue. In the end, the fact that English isn’t the official language of the United States hasn’t stopped it from becoming the dominant language of the country, with native English speakers comprising about 82% of the population, native Spanish speakers ringing in at number two at about 13%, and various other European and Asian languages comprising the bulk of the balance. However, despite about 18% of the U.S. population natively speaking a different tongue than English, a full 96% of United States citizens speak English fluently. So barring something catastrophic happening, it seems unlikely in the foreseeable future that English is going anywhere as the de facto language of the United States. Some words were actually originally English words that are now considered “Americanisms”, such as “fall” as a synonym to “autumn”. “Fall”, in this sense, was common in England in the 16th century but has long since fallen out of favor outside of North America. Another one is “gotten”, being the past participle of “get”. This was a common word at one time in England, but died out except in parts of North-East England and North America where it’s still somewhat common. 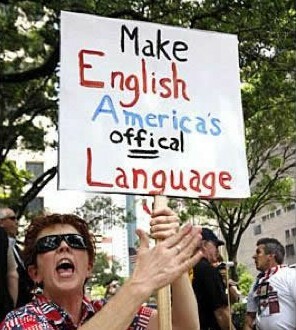 It is estimated that about 2/3 of the world’s native English speakers live in the United States. Not to pick on him (I really know nothing about the man, except about the two bills he’s recently helped introduce and a few awkward quotes from him. As such, I have no real opinion about him personally, as one can never really judge a politician by such things, particularly those belonging to a party.) But, in 2011, Steve King attempted to introduce a bill that violated the constitution of the United States much more explicitly than the “English Only” bill. Specifically, he attempted to put an end to “birthright citizenship” in the U.S., meaning just because you were born in the United States would no longer mean that you were necessarily an American citizen; it would depend on your parentage. King stated about the bill, “We need to address anchor babies. This isn’t what our founding fathers intended.” Again his second sentence is rife with political rhetoric (Can anyone really say they know what each of a group of unique individuals that lived a few hundred years ago really intended? And, further, should we even really care what they would have thought in making laws today? Shouldn’t we base new laws on the data at hand (including history’s lessons that so many politicians ignore or are ignorant of), and sound reasoning and logic, while always forging the laws against the crucible of protecting our core rights and liberties? Again, I highly doubt this second sentence was anything but a politician practicing his craft.) In any event, as you might expect, this potential legal change hasn’t yet manifested due to the fact that it violates section 1 of the 14th Amendment, “All persons born or naturalized in the United States, and subject to the jurisdiction thereof, are citizens of the United States and of the State wherein they reside.” King stated in an interview on CBS that he does not interpret the 14th Amendment as protecting birthright citizenship… even though it’s pretty explicit about it… “All persons born or naturalized in the United States… are citizens of the United States.” Whether one thinks this is right or wrong (I can see compelling arguments on both sides on this one), I’m not sure how that can be interpreted any other way. While it only has 1,000 native speakers, Hawaiian is one of the official languages of Hawaii (along with English). Despite the low number of native speakers, Hawaiian has seen quite a resurgence in the last couple decades, today having over 3 times as many people that can speak Hawaiian than in 1993. This new life for the Hawaiian language has come thanks to various programs by the Hawaii State Legislature with the aim to get more people to learn to speak Hawaiian. The first documented instance of anyone using the phrase “United States of America” came on April 6, 1776 in an anonymously written article in the Virginia Gazette, published in Williamsburg. This was about two months before Thomas Jefferson used it when penning the Declaration of Independence. The label for the United States became somewhat official on November 15, 1777 when the Second Continental Congress put in the Articles of Confederation, “The Stile of this Confederacy shall be ‘The United States of America’.” Despite this, several treaties involving the U.S. wrote it as “The United States of North America” in the early days of the country. The bad thing I can imagine right now is that translation can lose meaning and open to interpretation by someone other than a judge, creating unneeded confusion. I live in NYC, Queens to be precise. There are over 300 languages and dialects spoken in Queens. Signs are posted in chinese, korean and spanish, but not in english in many cases. I think people should have the right to speak their language in their home, however, in public places the language should be english and the signs should be in english. We are losing the significance of the United States of AMERICA! if english is not official language, then, why speaking basic english is required to become a citizen? Maryann, “America” is the name of the landmasses that make up the continents of North, Central, and South America, most of which speaks Spanish or French. Therefor, that argument is essentially meaningless. And as the article points out the meaning of America is to be a democratic group of people, regardless of the language. It was a very thought out point not appointing an official language. @Shane: True, but that didn’t actually do what you might think. The bill was extremely watered down and in the end basically set to “preserve and enhance the role of English as the national language of the United States of America” rather than explicitly making it the national or official language. Then, directly after they passed that (literally about a half hour later), they passed another Amendment (4073) that directly contradicted much of what the first said, further watering it down so that the whole thing was extremely pointless. Essentially, they were trying to create something that sounded like it was doing something, so that certain parties involved could get votes by saying they fought and voted for something to make English the official language of the U.S., without actually accomplishing that. Because voters don’t actually bother to look into these things most of the time, few would catch them at their half-truth/half-lie. Politics at its best. @Sasha: Thanks for catching that. Fixed! The worst thing is that Americans have made pointless alterations to the English language, and then they try to sell it off to the rest of the world as their own. I recently saw an American trying to tell someone the word “realise” should be spelt with a “z”. That’s because in American English it is spelled with a Z. However this is not the case in other dialects of English. I find it humorous that people will quote the amendments to justify having guns on the street, but then turn around and say that pieces from said documents about the English language are nothing and should be disregarded. I’m all for English being the official tongue of the American people, every other country has an official language, why can’t we? Because we have a diverse group of cultures? So, they can speak whatever they want, all we would be doing is putting it on paper. At the time of this pieces writing, 80% spoke ONLY English. Another 2013 study by the CB said that only 7% of people DON’T speak English. What more needs to be done? Actually if a lot of Native Amerkcans were still here then their language could have been the main language. A lot of Native Americans ARE still here, but sadly, not many of us speak the original languages. After years of being forced to “speak English” the languages have been mostly forgotten. But if you look at a map, many of the words survive as place names. I live in Macoupin county (Indian name) Illinois (another Indian name) near the town of Piasa (Yet another Indian name). When you think of it, the language we call English is chock full of other languages. Care to have a burrito on the veranda? Actually,if there has to be an official language,I suggest,Mohawk.or Lakota.or Navajo,or Seminole You know,AMERICAN!! I do know how some might feel though. I once had a foreign language shoved down my throat in boarding school…….ENGLISH! But,if English is to become the official language of the land,there are several million people who are going to need lessons. They live in Texass,Miseryssippi,Joja,and Loseranna. When I hear such misery in reference to a society I can’t help but wonder why they are here? Regardless of past wars, this is where you are today, and it becomes what you do with it despite issues of yesterday.Until we let go of the baggage we will never move forward. USA has the SECOND largest population of native Spanish speakers in the world. Mexico is the first. As of 2012, Hispanics constitute 17% of the United States population, or 53 million people. This figure includes 38 million Hispanophone Americans, making the US home to the largest community of Spanish speakers outside of Mexico. May be worth pointing out that here in the UK we don’t even have English as our nagional language. You would think the country that gave the world the language would have it as their official language. So the US isn’t the only one with this issue. 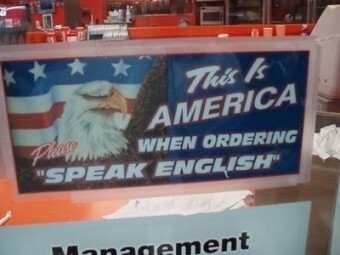 Also, American English is just an English dialect really, a few different spellings and meanings but that’s about it. It could even be argued that Americans speak a more natural form of English than the UK, due to a French influence that occurred on the language around the 18th century in Britain, bypassing the US (fall, autumn etc). Although English is not the “official” language it is the “implied official language” as evidenced by the requirement to naturalize a person must demonstrate the ability to speak, read and write the English language. English is the “de facto” language of the United States, since many millions more people speak that language that any other. Period.That’s a fact. 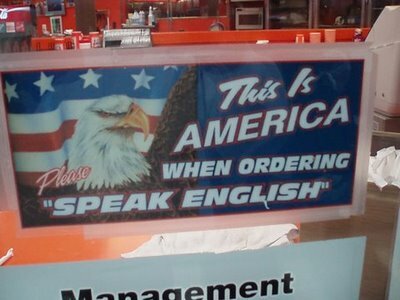 It is also true that , traditionally, while first generation immigrants hang on to their native language , customs , and habits, their children, grand-children, and other future generations, will consider themselves to be “american”, and sometimes will even refuse to speak any other language but English. So, as Billy might reflect, all this controversy seems to be, well, much ado about nothing…. The vast cultural diversity of the U.S. is one of those characteristics which makes the country not only great, but interesting. The cost of carrying out government business in the more than 300 languages found in the U.S. would be prohibitive, so that alone merits standardizarion of one language. In any case, I suggest a group of us reconnoiter the land for a while, then rendezvous on a veranda to eat some burritos , as someone else mentioned here, or perhaps some pretzels, or pizza, and talk this over.